When a couple moves in together, they often find that there are tough decisions to be made. There might not be enough room in the new space for everyone’s belongings, or there may be a doubling of some items (such as two coffee makers) that renders one unnecessary. When it comes to finding space for everything you need, it can be tricky, especially when you’re on a budget. That’s why looking for creative storage solutions and inexpensive (yet tasteful) decor is so important, but it doesn’t have to be stressful. Do some research online to look for coupons and cashback opportunities at the stores you love to shop at. This is a great way to save money while still getting everything you need and without sacrificing quality. Many stores offer discounts for shopping online during certain days. Shopping online isn’t always advantageous when you’re looking for clothing, since you can’t try the items on, but shopping for decor and storage options is much easier. Many mainstream retailers offer considerable discounts when you shop online, particularly depending on the season. For example, you can grab extra savings with a Target in-store coupon or promo code to stretch your dollars. Best of all, most retailers offer free shipping after a certain price point. -- usually $35-$50. One of the most fun aspects of moving in together is picking out new things like towels or dishes. Bed, Bath, and Beyond has a ton of items to choose from for every room in your home, and they also have great storage solutions that will help you make the most of your space. They also offer great coupons, both in-store and online. If you’re pressed for time and can’t sort through all the offers and deals, consider downloading a mobile coupon app, which automatically applies the best coupon to your purchase when you’re ready to buy. This is a great way to save money and time while you look for items to fill your new place. There are many apps available, so explore to find the one that works for you. If you have a crafty sensibility, consider looking for useful items at thrift stores and flea markets that can be redone to suit your needs. It takes a good eye to catch a find; you have to overlook the way a piece is presented initially and see the qualities underneath old layers of paint or dust. An old dresser can be painted and repurposed as a kitchen island with plenty of drawers for storage; a small buffet can act as a television stand in the living room. This is a great way to add functionality and style without spending a ton of money. One of the easiest and least expensive ways to liven up a room is to add a dash of paint to the walls. You can go bold and paint the ceiling as well, which can make a smaller room look bigger, or throw some chalkboard paint onto a cabinet or wall in the kitchen for a little whimsy. Sherwin Williams frequently offers special discounts, so take advantage of these sales to cut costs. 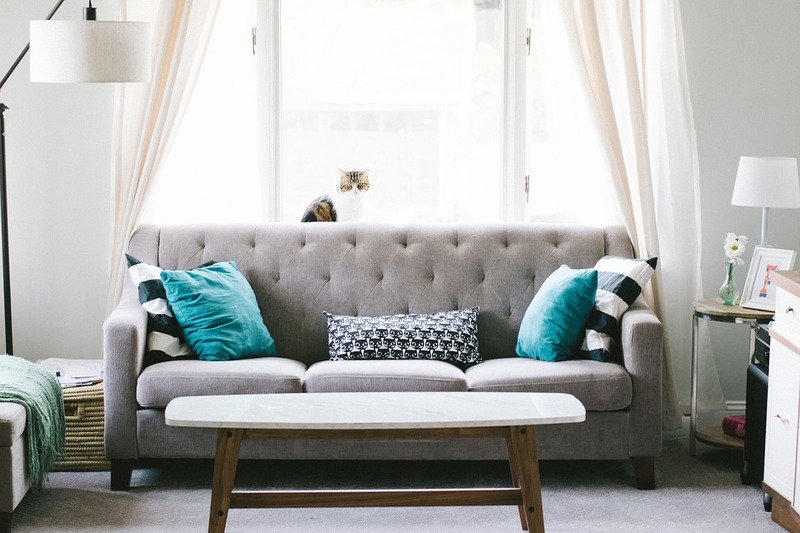 Decorating your home on a budget doesn’t have to be a stressful endeavor, and it doesn’t have to cost you in anxiety or hard work, either. With a little creativity and some research to find the best deals, you and your partner can have a lovely house that meets your needs and shows off both your personalities at the same time.